This 44-year-old police officer was directing traffic when a car traveling at 60 miles per hour ran him over. 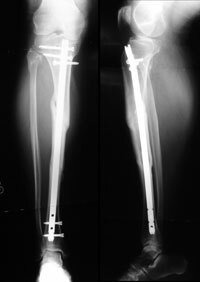 The patient sustained severe fractures to both tibias that were initially treated at an outside facility with intramedullary nail fixation. 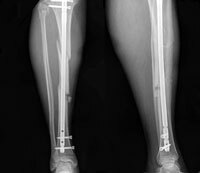 The patient failed to unite his right tibia and was referred to Dr. Brinker for continued care. Initial visit X-rays of the right tibia show that both the upper and lower fracture sites had failed to heal (a segmental tibial nonunion). The patient had severe pain and was unable to walk. This gentleman was treated with exchange nailing and his tibia healed rapidly at both nonunion sites. At follow-up he is free of pain and walks without ambulatory aides.